DESCRIPTION – Patchwork Sailboat Ornament. DESCRIPTION – Decorated wreath with 80 Plastic holly leaves, 16 frosted pinecones, 16 clusters of red plastic berries, 8 red plastic fruits, 8 red gift boxes, 8 red balls and 30 plastic pine tips. This wreath works great indoors or outdoors. Just put a bow on it's ready to hang. Also works great for cemeteries. Outside Diameter 16 Inches. DESCRIPTION – This red poinsettia bush has an over all height of 12 inches, 4 poinsettia flowers measuring 5.75 inches in diameter, 3 poinsettia flowers measuring 4.75 inches in diameter, and 21 - 2 inch leaves. DESCRIPTION – This metallic peach poinsettia pick has a 4 inch stem and an overall length of 8 inches, 3 leaves and 3 flowers that measure 2.5 inches in diameter. DESCRIPTION – This metallic mauve poinsettia silk flower spray has an over length of 16 inches, an 8.5 inch stem, 6 flowers with a 2.5 inch diameter and 9 leaves. DESCRIPTION – This metallic peach poinsettia silk flower spray has an over length of 16 inches, an 8.5 inch stem, 6 flowers with a 2.5 inch diameter and 9 leaves. DESCRIPTION – Pink silk poinsettia spray. DESCRIPTION – Poseable Elf, 13 inch, 2 assorted colors. DESCRIPTION –Red 20MM glass balls with a wire. 12 Per bunch, 12 bunches per box. DESCRIPTION –Red 25MM glass balls with a wire. 12 Per bunch, 12 bunches per box. 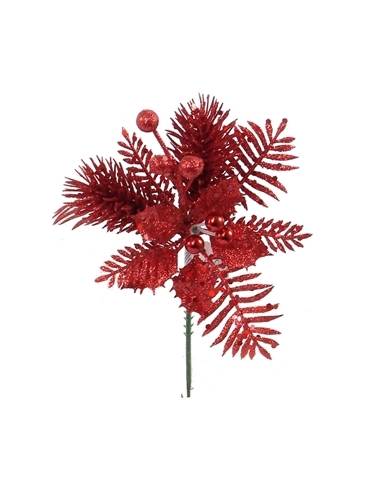 DESCRIPTION – Red glitter cypress pick with 8 branches, overall length of 14 inches and a 5 inch stem. Price reduced Jan 17, 2018. DESCRIPTION – Red glittered eucalyptus spray with 3 branches, an overall length of 17 inches and a 5.5 inch stem. Price reduced Jan. 17, 2018. DESCRIPTION – Red glittered pick with 5 holly leaves with 2 shiny gold metallic stamens, 2 pine sprigs, 3 small and 3 large fern leaves, 5 berries with an overall length of 8 inches and a 4.5 inch stem. Price reduced Jan 16, 2018. 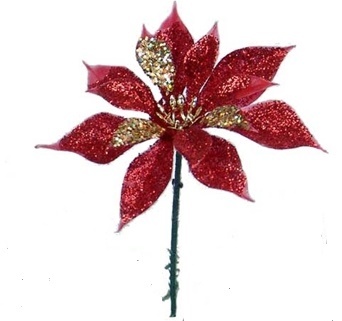 DESCRIPTION – Red glittered poinsettia pick with one 3.5 inch poinsettia and a 5.5 inch stem. DESCRIPTION – Red holly berry pick with 36 berries, an overall length of 6.5 inches and a 4.5 inch stem. Price Reduced Jan. 16, 2018. Price Reduced Mar. 22, 2019.